LONDON (21 March, 2018) -- Two Roads Picture Co. has announced the premiere of its first feature No Postage Necessary which is set to make an unprecedented, world-wide debut on the blockchain in June, 2018. The dramatic comedy about a luckless computer hacker who falls for a pretty war widow will be the first-ever feature film to be available to stream on a blockchain platform and available for purchase using cryptocurrency. 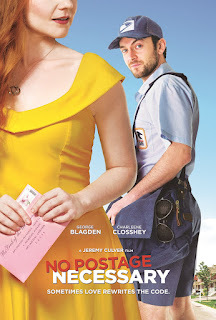 In No Postage Necessary, Sam (George Blagden) always seems to make the wrong decision. A convicted computer hacker, he's single, jaded and barred from using the internet. Forced to crash on his brother's couch, he makes ends meet by working at the local Twistee Treat and stealing mail while disguised as a postal worker. Then, a single pink envelope changes everything. Handwritten by a heartsick Josie (Charleene Closshey) to her late husband and fallen Marine, the tender missive awakens something in Sam. Desperate to be worthy of such love, he conspires to meet the beautiful, young war widow, longing to become a better man. As the two grow closer, she warms to the idea of a new chance at love, but not before Sam's past comes knocking in the form of an FBI agent looking for missing bitcoins. Speaking to the serendipity of a movie about bitcoin being the first to release on the blockchain, Culver notes, “Up until now, the technology just hasn’t been ready - there wasn’t a platform to support the vision. But, innovation creates its own timing. As we were putting the finishing touches on the film, we met Thomas Olson at Vevue, a dApp (de-centralized application) running on Qtum, a blockchain platform we had been tracking for some time. Since Thomas and his team were in the advanced stages of developing a video distribution channel most others were only talking about, and with Qtum being the only truly decentralized platform able to support the transaction load, the partnership really came along at the perfect time,” says Culver.